Steven (Chicagoland, United States) on 30 August 2016 in Architecture and Portfolio. New York New York Hotel & Casino is a hotel and casino located on the Las Vegas Strip at 3790 Las Vegas Boulevard South, in Paradise, Nevada. New York-New York uses the New York City influence of its name in several ways. Its architecture is meant to evoke the New York City skyline; the hotel includes several towers configured to resemble New York City towers such as the Empire State Building and the Chrysler Building. In front of the property is a lake representing New York Harbor, with a 150-foot-tall (46 m) replica of the Statue of Liberty, and replicas of the Soldiers and Sailors Monument, the Whitney Museum of American Art, the Main Immigration Building on Ellis Island, and Grand Central Terminal. 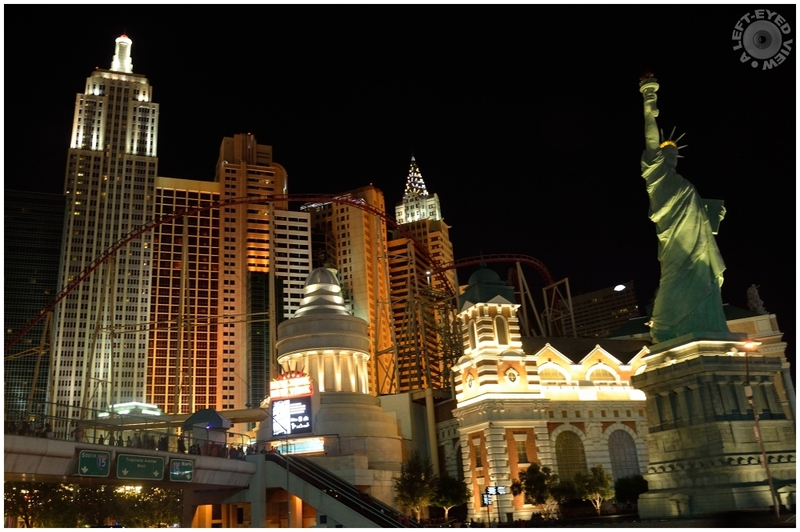 Within the resort, particular gambling areas, lounges, restaurants, and meeting rooms are named after New York City neighborhoods or landmarks. The main casino area, for example, is named after Central Park, while the shops are modeled after Greenwich Village. At the casino, special decks of playing cards are used where the "heart" suit is replaced by apples. Photo captured July 22, 2016. A gorgeous view! Good light. Une belle photo de nuit! which is perfect for the night scene which generates excitement ! Great shot and a sense of unreality about this, especially with the lighting. Another superb night shot. Las Vegas is an unreal place, but so interesting. A fine exposure and shot of the Vegas strip. A nicely shot night shot. Ah Vegas; you can see the whole world, but you don't want to set foot outdoors. Merveilleuse vue de nuit quels modernité et building superbe. Superb in that lighting ! Great lighting on the stutue.